Every year, Mecca hosts thousands of pilgrims and this pilgrimage is the main economic engine of that region of Saudi Arabia. As it is to expect, not only ardent defenders of faith move towards the holy places of the city, but also curious and non muslim tourists get closer and closer. As in every trip, language can be a problem when it comes the time of making yourself understood and understanding instructions of every nature, such as giving directions, prices and, very specially, food. That is why we tell you which is the Typical Food of Mecca, so that you know exactly what you will find and go directly to that section of the menu when you sit somewhere to eat out. Schwarma: it is a typical Turkish dish present along the whole Middle East and therefore, it is Typical Food of Mecca. It consists of thin slices of veal, lamb or chicken, roated in a vertical spit, which once prepared are generally consumed in flat bread, such as pide bread or pita bread, accompanied by vegetables and other ingredients. 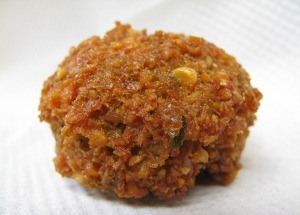 Falafel: it is a chickpeas or lima beans croquette, which can have a small hamburguer shape or a ball shape. It is fried in olive oil. It is typically used as an entry or as a part of the main stuffing of pita bread. The dough is made of flour, the chickpeas or de lima beans and with a wide range of spices that include cumin, cayenne pepper, garlic, parsley, coriander and black pepper. Fuul: even though it is not a dish itself, it is a paste of beans, garlic and lemon that is an intense dressing characteristic of the region to spread on bread or to use as food dressing. Shikamba: it is creamy soup served with meat balls. Kofta: it is spinach with mince, rice and tomato sauce. Halva: it is a pie which dough is made with dates and dried apricots to which chopped walnuts are added. Baklawa: it may be one of the most representative Arab desserts. It is a pie filled with walnut paste and covered with syrope or honey syrope. It is wrapped in phio dough, typical of the East. Tea: it is amost every Arab dessert’s mate. It is always served without milk and with a lot of aromatic herbs. Finally, we could not leave without mentioning the coffee as the great finale for every Arab food, especially for all Typical Food of Mecca when you travel to that region.